Blush Beauty and Makeup: Happy Monday! Good evening, my friends. It's Monday! I know, I know..I just rolled my eyes at myself for even saying that. You wanna know some good news though? Tomorrow is Tuesday. One day closer to the weekend. Word! I get a lot of people who ask me about techniques and brands and colors when it comes to buying and applying eyeshadow. This is something that I try to experiment with a lot. There's nothing wrong with stepping out of our comfort zones and trying something new. But...for those of you that aren't quite ready to try a blue smokey eye, here's a product that will build your confidence and look amazing at the same time. I love Sonia Kashuk products! You can find her products at Target and they are fairly inexpensive.This particular product pricing out at $19.99. Her line is classic and offers great quality for someone who is livin' on a budget. 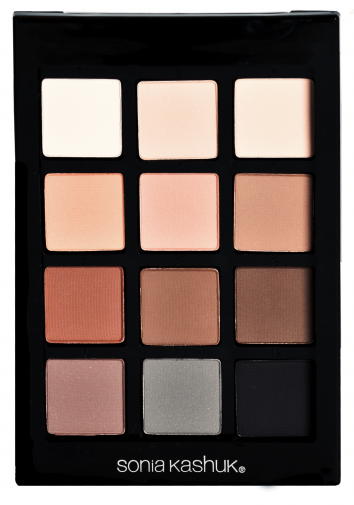 One product that I recommend a lot is her 12 Core Shade Instructional Eye Palette. This palette is comprised of your essential neutral shades. They are also matte, which is going to be easier to work with as a beginner. The velvety soft textures glides on nicely and is easy to blend. This palette comes with step-by-step instructions for three different eye looks. It's kind of like painting by numbers! Experiment. Try different looks. Find out what looks best with your skin tone, your face shape, and your eye shape. It's all about what makes you feel beautiful and confident. Now go forth and play with make up!